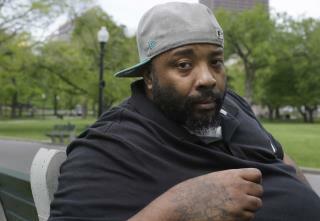 (Newser) – Emory Ellis, a black homeless man in Boston, went to Burger King for breakfast and tried to pay with a $10 bill. That simple transaction in November 2015 led to a series of mistakes that landed Ellis in jail for more than three months, reports the AP. It started with the cashier, who accused Ellis, 37, of paying with a counterfeit bill and called police. The police took Ellis to jail and charged him with forgery. Ellis was on probation and the arrest violated that probation, so he was denied bail. The whole thing was cleared up in February 2016 when the Secret Service determined that the bill was real. Now Ellis is suing Burger King Corp., the franchisee, and the cashier for $950,000 in damages. The case was first reported by Law360. These people are using the police for stupid things.They have more serious matters to worry about. I have family members and friends who are police officers and they are fed up with all the stupidity. What happens if a life is lost in the process if things get out of hand? I have to give credit to the Police over the past months who have been called on people of color to make stupid accusations. They have acted in a professional manner. I must say professionals because many of them are just that.